I dare to try vegan on the eve of one of the Omnivore Kingdoms most sacred Holidays. Read how it went down. I had always been fascinated by Tofurky. I had always wondered what it would’ve tasted like, curious about what something from some test kitchen had managed to conjure up. As an adult, a few acquaintances of mine have gone vegan on me for whatever reasons and for different lengths of time. Now, it was my turn to take the plunge into the world of veganism on one of those days holiest to omnivores: Thanksgiving. I searched around for the Tofurky that would become my little adventure into the world of meatless celebration. 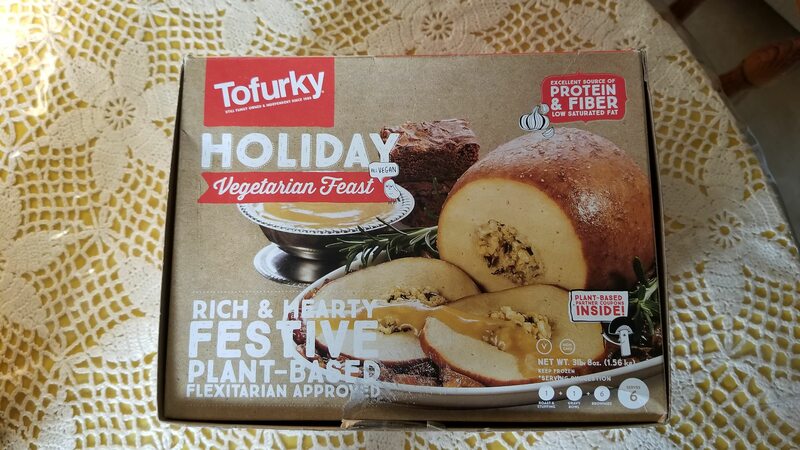 I managed to find not just the tofurky, but a set that included a few other goodies to make a small holiday celebration fit for even the most finicky of vegans. 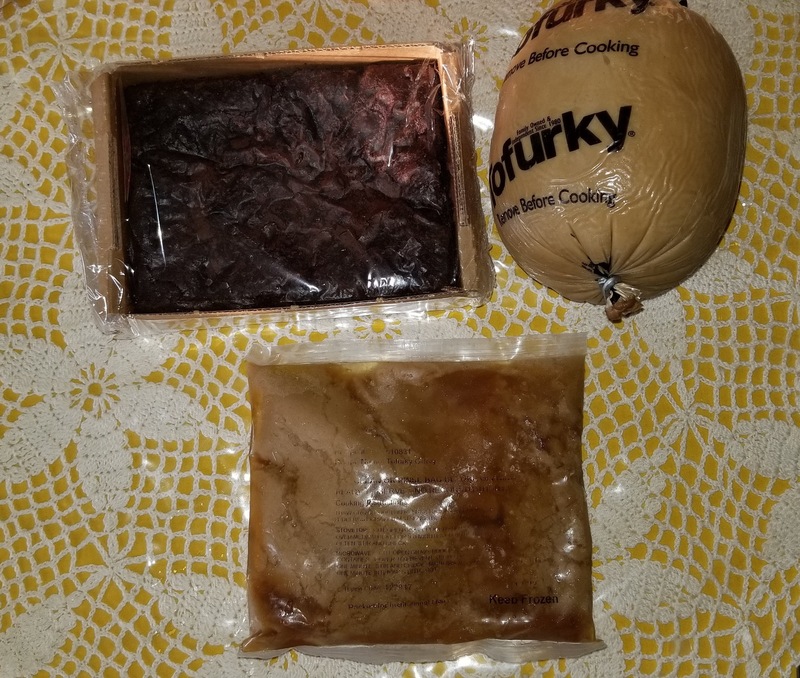 The kit itself comes with the Tofurky, a package of gravy and a box of vegan brownies; all ready to heat and serve right out of the box. I found it in the frozen section of the store, so keep it on ice until a day before you plan on serving it. The Tofurky itself is a pretty small main entree, I’d guess about the size of a pomelo. 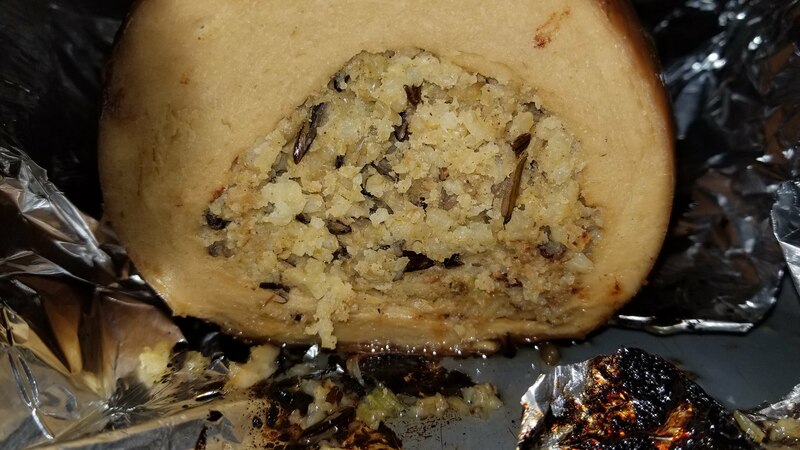 It’s stuffed with dressing inside, which consisted of a savory bread crumb and rice mixture. The gravy packet seemed a bit small, but upon actually warming it up and serving it, it turned out to be quite generous. Finally, the brownies themselves came in a small cardboard box. Unlike most of the stuff inside, the brownies actually resembled brownies. Full disclosure: Lola (aka Grandma for non-filipinos) did the honors of cooking it for me while I was at work. To be honest, I asked her to do it since she has this magic of improving upon just about any recipe she can find, and I wanted this to be an unforgettable experience. She did baste the turkey based on the instructions given on the box: which was a baste made of olive oil and soy sauce. Knowing her, the ratios were whatever she felt like doing. I had invited my friend Tom over for dinner. Tom has been a vegan for over 6 months and I asked him to try the Tofurky with me, since this was something I felt I couldn’t do alone. Since this was the first time for both of us, we were both very curious about how this would turn out. While I was outside greeting him, the smell of the tofurky permeated the air in spite of the smoke we were experiencing from the wildfires up north a few weeks ago. It was fascinating that we could still smell a delectable holiday meal being made almost half a block away. The insides of this thing. After we got settled in, I served my friend his share of the tofurky and cauliflower mashed “potatoes” (I’m going low carb, another sacrilege against the sacred holiday that is Thanksgiving). I took my first few bites. While eating my first bite, the only thought going through my head was that I wasn’t sure why people would want to do this. The texture was just bizarre to me, the chewiness and just the overall mouthfeel of the whole thing. However, I will give them props for the flavor, the did a great job of getting as close to the flavor of genuine turkey as possible. The texture threw me off, but as someone who is not a seasoned vegan, I just couldn’t make it past the texture. Tom and my dad, both vegans to certain degrees liked it, and I wish I could have their acquired taste for meatless substitutes to enjoy this. I didn’t really enjoy this too much, but overall, The effort these people put into their creation is worth giving them applause. But don’t take my word for it, here are the opinions of the other two who went to town on this feast with me. Tom – I was able to smell the aroma of the tofurky as I parked my vehicle outside of the house. Definitely replicated the smells of a roasted thanksgiving dinner. Aesthetically the tofurky dinner did have its turkey like appeal. Which excited me to dive into the meal. The first thing that stood out to me was the texture of the faux turkey. It was a bit chewy and did have the consistency of similar other vegan alternative foods. The highlight of the meal was the flavors. It was peppery and has the same flavors as a real turkey. It was slightly peppery and had tasted almost like baked honey ham in a strange way. My favorite has got to be the brownies because I don’t think you can mess up brownie. It was moist and had just the right amount of sweetness. Paired with a glass of soy milk just finished the meal perfectly. As a vegan I give this meal a thumbs up. The Dad Unit – Having spent a few years as a vegan, and continue to practice vegetarianism, i had my expectations. Getting past the texture of the outer skin of the “roast”, the texture inside closely approximates the feel and flavor of turkey, pluses in the wild rice stuffing, and flavorful, though not overly salty, gravy. Possible hacks would be the addition on fresh herbs in the basting solution (the box recommends sage, though rosemary would be a nice addition) or possibly a garlic infused olive oil. Definitely a start, but I would add additional sides for a more complete meal. Long story short, if you’re gonna go the vegan route for this thanksgiving, this box is a pretty good place to start (if you dare). You can always add your other sides (3 bean salad, mashed potatoes without the quotation marks, etc.) and make it an even fuller feast. I didn’t care for it much, but for those seasoned vegans this might be a good accomodation to your thanksgiving table. The brownies though, were amazing. Stay you vegan brownies, stay you.